Source: CICH graphic created using data adapted from Statistics Canada, Canadian Health Measures Survey, 2010/11 – custom runs. 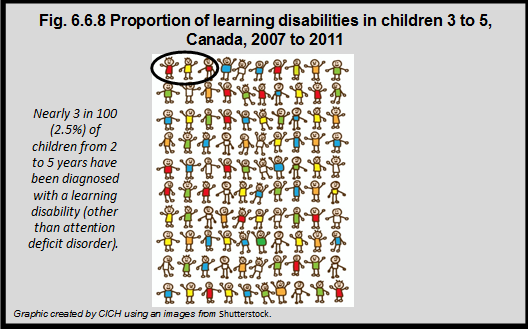 During the years 2007 to 2011, nearly 3 in 100 (2.5%) of children from ages 2 to 5 years were diagnosed with a learning disability (other than attention deficit disorder). 3Statistics Canada, Canadian Health Measures Survey, 2010/11 – custom runs. There are other environmental toxins that have been identified as having potential concerns for the developing nervous system and brain – these have not been as widely studied, but young children are exposed to them in Canada.